It has been successfully practiced in various forms all over the world for thousands of years. Yet only recently has it come to the forefront in western society. That’s because scientists have finally developed instruments sophisticated enough to measure how and why this mode of healing works. Considered ‘quackery’ in the past, many of these ‘alternative techniques’ are now being used in tandem with mainstream medical treatments, as exampled here by Vanderbilt’s Center for Integrative Health, whose patient volume has more than tripled since 2009. Ancient Indian texts accurately describe the human energy system. Information and diagrams not only detail where the main energy centers are located, but also what part of the endocrine system each energy center works with and how imbalances in the energy center affect the physical, mental, and emotional state of the person. Specific vibrational tools are suggested for correcting imbalances depending upon the particular energy center involved. These energy centers and the energy field surrounding the body can now be seen using Kirlian and other specific photographic equipment. Everything in the universe is energy. Nothing is actually solid. Objects are made up of microscopic particles vibrating at such a fast rate that they appear solid. Our limited sense of sight doesn’t allow us to see the movement, or vibration of these particles. Every object, including human organs, have a natural, healthy vibratory rate referred to as ‘resonance.’ If a part of the body begins to vibrate out of resonance or harmony, it creates what we call dis-ease. 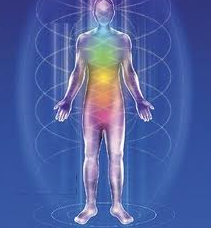 Energy Therapy looks at the energy anatomy within and around the physical body. Imbalances and disharmonies are treated using frequencies from flower and gem essences, sound, therapeutic grade essential oils, radionics, homeopathics, acupuncture, color, hands-on-healing, and crystals. Each individual sound, color, crystal, or flower essence has a specific quality that is beneficial for a particular human organ, system or emotion. Part of the intense interest in the field of vibrational/energy medicine is the knowledge that disharmony shows up in the energy field before it becomes a problem in the body. If imbalances can be detected while still in the energy field, theoretically dis-ease can be avoided all together. Another plus for vibrational/energy healing is that it seems to have no negative side effects. It does, however, tend to produce more smiles, more energy, and an overall feeling of well being. Over the next several blogs, I will be sharing some very cool information regarding: frequencies of health for the body, how emotions can create or heal dis-ease, protection from electromagnetic frequencies, sound, and hands on healing.